Should you marinate your grass fed steaks? Tenderize and enhance the flavor of your grass fed beef with marinades. 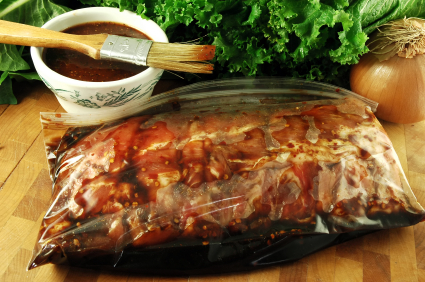 Marinades do two basic things to meat: they tenderize and enhance flavor. Since free range grass fed beef can be slightly tougher and less marbled with fat than its less healthy feed lot counterpoint, some people like to marinate their grass fed steaks for at least a couple hours and even up to 24 hours. The acid in the marinade helps to break down the connective tissue and adds even more fabulous flavor. Also, slicing your grass fed beef thinly and on a slight bias increases tenderness as well. Marinades are comprised of three basic categories of ingredients: an oil, an acid (wine, vinegars & citrus) and seasonings (herbs & spices). You can really knock yourself out with marinades and seldom go wrong. Also, remember to thoroughly dry your grass fed meat after marinating then rub with olive oil and season with salt and pepper just before cooking. This ensures a nice crusty sear on the outside which will hold in juices. And, always let your steaks rest for a few minutes before cutting into them. It is also a good idea to cook your grass fed steaks slightly less than you might cook a corn fed steak – again because they are less marbled so this will also help maintain tenderness. A quick tip for mixing your marinades is to take a gallon size resealable plastic bag and stand it up inside of a 2 or 4 cup measuring cup. This keeps the bag stable as you add your ingredients. Then just add your thawed grass fed steaks and store in the refrigerator until you are ready to cook. As an example, try mixing equal parts olive oil, red wine & balsamic vinegar with 2 sprigs fresh rosemary, 4 cloves (or more to taste) crushed garlic and a teaspoon (to taste) of red chile flakes. Or, try using your favorite hot sauce (we like Frank’s) as a marinade – makes your steak buffalo style! Following are some suggestions for each category – mix and match! Oils like walnut, grape seed – just take a look at your local market to find new ideas! Any Topline Foods Signature Seasonings! So, experiment and have fun cooking your grass fed beef knowing it is better for you and your family!